These decorative dangling flower earrings from Apples of Gold Jewelry capture the light with their .925 sterling silver construction. Whether you are looking for a stylish jewelry item to wear to a party or just something to spruce up every day attire, these beautiful earrings, which have fish hook wire designed backs, feature blooming flowers with small silver beads placed throughout, adding extra character. These intricately designed flowers are sure to be noticed, and measure 1 1/3 inches tall and 3/4 of an inch wide. 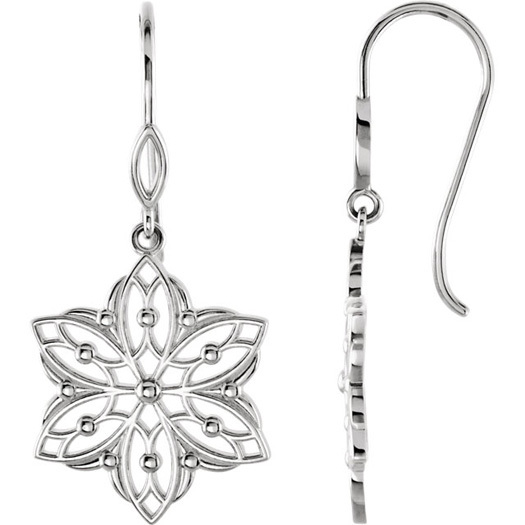 We guarantee our Decorative Dangle Flower Earrings in Silver to be high quality, authentic jewelry, as described above.